May 12, 2017 – Boston, MA – The Environmental Business Council of New England (EBC) is pleased to announce that the Muddy River Flood Risk Mitigation and Restoration Project and its accompanying public and private organizations is the recipient of the 2017 EBC Nicholas Humber Environmental-Energy Award for Outstanding Collaboration. 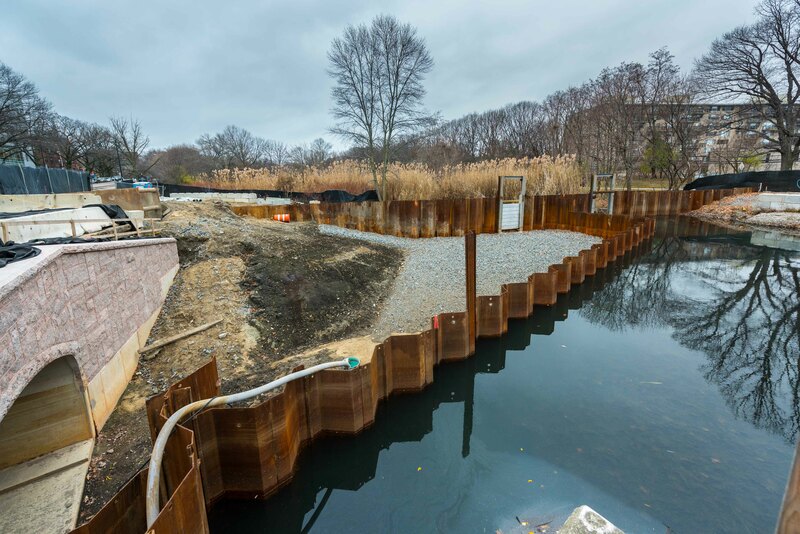 The Muddy River Flood Risk & Restoration (Muddy River) project is the highest-profile design-build project located in the heart of Boston undertaken by the United States Army Corps of Engineers, New England District (CENAE) in the last 20 years. 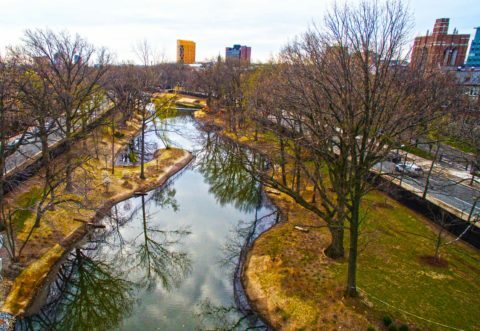 The project brought Frederick Law Olmsted’s original design for the Muddy River back to life, enhancing the environment and giving a vital green space to the heart of Boston. Historically, the area surrounding the river had been impacted by substantial flooding events that caused extensive damage to surrounding businesses, the MBTA, and led to road closures. To alleviate the burden that development and commercialization of the area had caused to the river flow, the existing, undersized, 6-foot diameter pipes that carried river flow were removed. The stretch of river, from the Riverway downstream to Avenue Louis Pasteur, was reconstructed (or daylighted), and two 24-foot wide precast arch culverts able to handle heavy water flow under two heavily trafficked roadways were installed. The project had a unique set of logistical challenges that required effective communication across all stakeholders and innovative thinking. High vehicle and pedestrian traffic volumes in densely populated, congested urban area required that all facets of the project be precisely sequenced, including: (1) dewatering sequence closely coordinated with culvert installation, trunk utility line and two large storm drain relocations, seasonal weather conditions and types of dewatering systems being installed; (2) 8-stage traffic management plan addressed construction within roadways; (3) material deliveries pre-planned to coincide with project needs because of small on-site material lay-down area; (4) sediment dewatered and loaded into trucks immediately rather than interim stockpiling; (5) utilities interim and final locations planned to assure service; (6) subcontractors scheduled to prevent congestion in confined job sites; and (7) turtle and fish relocation planned into schedule. Land-side restoration included complete restoration of roadways, sidewalks, and traffic signals surrounding the project limits. The wetland restoration included: installing more than 25,000 native plantings; installing 4,200 LF of landscape protection fence and 10,000 LF of herbivore protection fence for proper establishment of plantings; developing and implementing invasive species management plan; reconstructing Olmsted island within the center of the river; and 6 acres of seeding. Due to the significance and importance of the project to the community, this project had numerous stakeholders / sponsors and special interest groups following it closely. The stakeholders / sponsors included CENAE, Commonwealth of Massachusetts, Massachusetts Department of Conservation and Recreation, City of Boston, and Town of Brookline. The project was constructed by Charter Contracting Company, LLC, and major team subcontractors, Fort Hill Infrastructure Services, and SumCo Eco-Contracting. The construction team received engineering support from GZA GeoEnvironmental, Inc. who provided geotechnical engineering, earth support, and water control. The Nicholas Humber Environmental-Energy Award for Outstanding Collaboration was established by resolution of the Board of Directors on March 4, 2002, and recognizes an environmentally-related endeavor which is a joint or shared project between an EBC member and another person or entity and which reflects the global environmental values and human spirit exemplified by Nicholas Humber. Nicholas Humber (1941-2001), President, Brae Burn Management, was an active member of the EBC. He served as the chair of the EBC’s Innovative Technology Committee from 1997 to 2000 and prior to that chaired the International Business Committee. It was a tragic loss to Nick’s family and friends and the EBC when it was learned that he was a passenger aboard American Airlines Flight 11, which crashed into the World Trade Center on September 11, 2001. Nick earned his bachelor’s degree in mechanical engineering from Rensselaer and received a master’s degree from the Wharton Graduate School at the University of Pennsylvania. He worked tirelessly for the environment, beginning in 1971 when he joined the newly created U.S. EPA and co-founded the national waste-to-energy and recycling programs. As an adviser to the World Bank, a founder of Energia Global, and past president of BioMed of Boston, Nick’s life and career was committed to improving the quality of the environment for current and future generations. The Muddy River Flood Risk Mitigation and Restoration Project and its primary collaborators will be honored at the Annual EBEE Awards Celebration on June 8 at the Marriott Copley Place Hotel in Boston, Massachusetts.